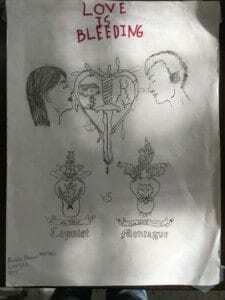 For my project of Romeo and Juliet I decide to make a book cover relating to the book Romeo and Juliet but with different character but mostly the same reasons in the book. But my theme is that love can come with a lot of sacrifices like in my cover as you can see the two main lovers are taking a big risk in their lives to loving one another because they both come from different families and classes and race this connects to society because in this world all people aren’t allowed to date the person that comes within their heart but instead people are sometimes not allowed love the way they want because the other lover might be a different race or can’t be in a love because of the class of he/she. The reason that I named my book cover Love is Bleeding is because in the actual book Romeo and Juliet they risk a lot to stay together it is like they are bleeding for their own love. Also the meaning of the knife striking the heart means that both of them end up dying for their love and the vow to love each even though each families can’t. Also as your can see on one of the sides of the heart one person is poor and one person is rich and wealthy. The symbols that say capulets and montagues are the meaning are of different types of teams and people like rich and poor, people of color and White people and in this case both are not allowed to date on is poor and the other one is rich and the both families don’t approve. That also shows how rivalry can come between a lot of stuff and in this case rivalry can cause a lot of death and violence. On the back you will see a summary of what the book is kind of about. It’s about two young lover who cant fall in love because both are different in ways that other people might not approve. So they both have to sacrifice to be able to love each other in a secret but that can caused them and other people very bad consequences. Love Is Bleeding by Manuel is licensed under a Creative Commons Attribution-ShareAlike 4.0 International License.